Working in a correctional facility requires hawk-like awareness and relentless courage. In the American prison system, men and women are brought in every day for crimes they have committed. However, though they are in jail to atone for their crimes, correctional facility nurses are expected to keep inmates healthy for the duration of their sentence. In the prison system, there are many reasons why people would need medical attention. Emergency medical situations happen a lot in the prison system, which is why correctional facility nurses often have busy schedules and plenty of patients to help. 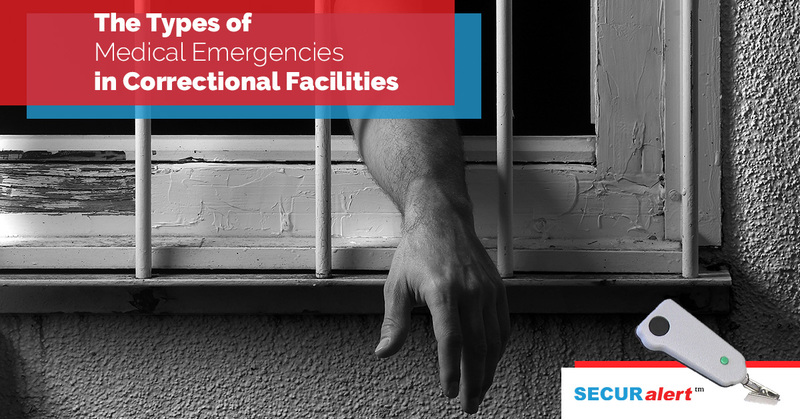 In this blog, we will discuss some of the emergency situations correctional facility nurses must be faced with and why a SecurAlert emergency button system could save lives. Correction nurses have to be prepared for everything. The prison system is unpredictable, which means medical professionals need to be prepared for anything from cleaning wounds to resuscitating an unconscious inmate. Preparation can also ensure that if an emergency were to occur, a nurse would have the tools necessary to keep the inmate stable until the proper authorities are contacted. Being prepared is a nurses best defense against negative outcomes, by having the right equipment, knowledge, and communication devices, help can be administers swiftly. SecurAlert can be advantageous for correctional nurses because they are small enough to carry on their uniform and powerful communication devices. With just one simple push of a button, the authorities can be alerted that a correctional nurse has alerted them. Of course, while on duty, pushing this button can be used for medical emergencies for a fallen inmate, or for the correctional nurse. If a nurse has become ill on shift, this can be dangerous for them, but also the wellbeing of the prison. Having a communication device to alert the authorities when something wrong is vital to the function of a correctional facility. SecurAlert systems are also beneficial for correctional nurses because they offer direct contact with the authorities. When you press on a duress button from SecurAlert, the button sends a signal to the nearest authorities. Also, when pushed, the button sends out a signal of your exact location. By using ultrasonic technology, the authorities can be notified of your exact location from inside the correctional facility. That means, if a nurse had to treat an inmate immediately, the button would be able to alert someone for help. When in a medical emergency, nurses don’t have the time to explain their surroundings or where they are located inside a correctional facility. Most prisons are structurally complex and comprised of multiple sections and corridors. In an emergency, a nurses duty is to their patient and to keep them alive, not to give directions. To simplify the situation, SecurAlert offers direct, and precise location signals to the proper authorities. Because of this, nurses can signal immediately and have help arrive with no time to waste. This means that nurses can not only do their job, but quickly get help in order to save the lives of their patients. When Could SecurAlert Be Useful? As a correctional nurse, you have to be ready for anything. Dangerous emergencies can happen in prison, which means medical professionals have to prepared to handle and treat life-threatening injuries. In prison, physical injuries, drug overdoses, suicide attempts, and anaphylaxis incidents are all the most popular emergency situations. Because of these, nurses have to be ready to alert the authorities and administer treatment while waiting for an ambulance. Correctional nurses are trained never to leave their patients until they are taken by an ambulance, stabilized, or unfortunately, die. Because of this, if a healthcare professional is the first on the scene of a medical issue, they cannot leave to get their needed supplies. This means that a nurse without a communication device is utterly alone on the scene and needs to yell for help. Correctional facilities can house thousands of people at one time, which means that they are large and heavily protected by thick walls of concrete. Because of this, nurses cannot rely on yelling for help as an effective form of communication. Today, with the help of technology, nurses can radio for help both to the authorities and the primary control room of the prison. However, though this can be an effective form of communication, there are still flaws in the speed and precision of the communication. With a SecurAlert duress system, communication is concise. Nurses don’t have to fumble for their walkie-talkies or try to audibly communicate with the outside world — instead they are focused on their patient. Anaphylaxis: Anaphylaxis occurs when an inmate has come into contact with something they are allergic to. Typically, this means that their immune system has overreacted to an allergen and causes severe allergy symptoms. For this medical emergency, epinephrine needs to be administered immediately before their throat swells and cuts off air supply to their brain. Because of the speed of the allergic reaction, immediate medical attention in necessary for the wellbeing of the patient. Drug Overdose: Many inmates in the correctional system are brought in for drug offenses. Even in prison, inmate populations have the means to bring in contraband drugs into the building. Because of this, drug overdoses are common, and must be addressed immediately. Medical professionals on the scene can administer Narcan (naloxone) which can help stabilize the patient and keep them from going into shock and dying. Bodily Injury: In prison, gangs and groups can form, causing unrest among the correctional community. Due to small feuds, large, violent fights can break out, which means that injuries can happen. In many cases of prison fights, one or more inmates are seriously injured. Because of this, nurses need to be careful if there is an ongoing fight. To keep nurses and medical professionals safe, they aren’t able to fully treat a patient until the fight is controlled. Suicide Attempts: An unfortunate emergency that is common in correctional facilities is suicide. Inmates can feel hopeless and wish to die before their sentence has been carried out. Because of this, medical professionals have to be careful and look for warning signs of an attempted suicide. For example, nurses have to be trained to treat inmates who have attempted to hang themselves. Hanging is the most popular method of suicide in prisons. Nurses are trained to attempt to resuscitate the inmate, no matter how long they assume the inmate has been hanging. When it comes to suicide attempts, even if the inmate appears to be dead, does not mean that they are unable to be revived. All of these medical emergencies are life threatening and need immediate medical attention. Because a nurses duty is to their patient, they don’t have time to explain their location. With a SecurAlert duress button, they can contact the right authorities and get the medical attention that could save lives. SecurAlert systems have proven to be effective forms of communication in a range of buildings. SecurAlert panic buttons can be used for hospitals, schools, hotels, and even correctional facilities. Anytime that there is an emergency, a SecurAlert button can be pushed to send for help. To see the other uses for our duress buttons, visit our site today.